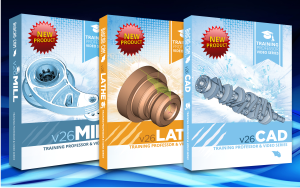 The CAD/CAM Training Manuals are perfect for software customers and even non-customers who want to learn from written instruction wherever they are! Each software training manual consists of hundreds of pages of detailed information regarding features that include CAD design, CNC software machining Wizards and strategies with explanations and tutorials. Each training book contains real-world examples and step-by-step tutorials that guide you through learning how to use the software. Important Note: Each of the above software training manuals are best purchased and used along with the products corresponding Training Professor Video Series. These Manuals are the printed version of the training manuals that come digitally with the corresponding training video products.